Pagoda Guest House Bhaktapur i Bhaktapur, Nepal: Bestill nå! We do not consider Pagoda a hotel; it is rather a home. We started Pagoda a decade ago to provide travelers a 'Second Home' and so far we have been able to do that. Rest assured. You will never feel like you are far away in a distant land. You will always feel like you are with Friends and Family. We offer 6 different cozy and elegant rooms with attached and private bathrooms in Pagoda, and 13 elegant rooms with private bathrooms in Newa (New block of Pagoda) to make your stay comfortable and memorable. Room amenities include Multichannel TV, Couch, 24 hour hot/cold water, room heater, cooler. We also offer 24hr free room service. Our restaurant serves variety of delicacies - Nepali, Newari, Continental, Chinese, and Indian cusines to delight your taste buds. The roof top restaurant provides a majestic view of the world's tallest pagoda temple, the Nyatapola Temple, to the east, panorama of green hills to the south and wonderful snowcapped mountains to the north. We also arrange Newari feast on request. Pagoda Guest House stands 3- storey tall to the North-West of the famous Nyatapola Temple(Five Storey Temple.) Pagoda is less than a minute walk away from Bhaktapur Durbar Square; so, everything that there is to see in Bhaktapur is easily accessible. - Homely atmosphere & Hospitable behavior. - 24 hours hot & cold shower with Attached Bathrooms. - Roof top Restaurant serving delicious cusines. - Special Discount for Groups and Regular Customers. - Airport pickup on request. Beautiful guesthouse!! Rooms were good, awesome beds, warm water. Internet was strong, the food was excellent, and the staff was even better! Treats their guests as family and friends. Perfect location, beautiful view. 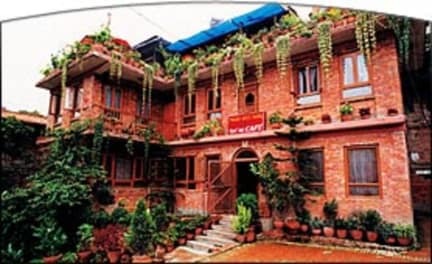 If you come to Bhaktapur, this is the place you should stay. And bring some clothes, shoes, colors, coloring books, or other things - they spend time handing out things to the needy, after the earthquake! !